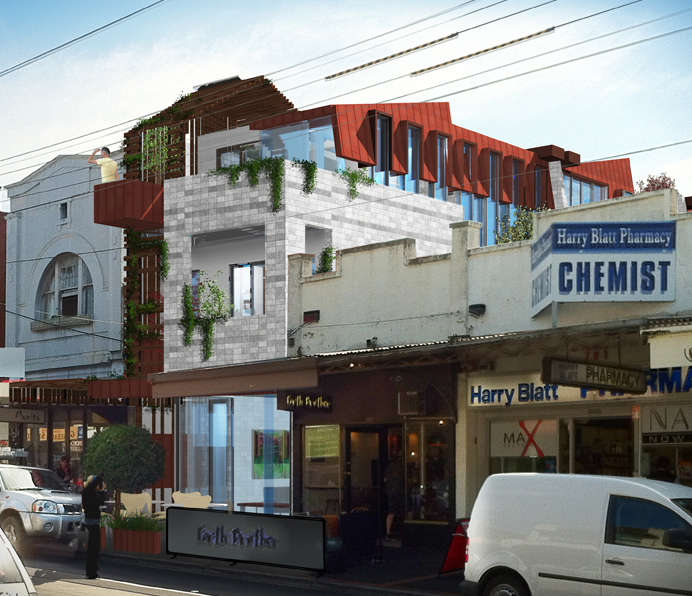 Last week 777 Glen Huntly Road was put in front of a Delegated Planning Committee at the City of Glen Eira and it was granted approval! The meeting went exceptionally well with even the sole objector congratulating my client and I on the project and agreeing with Council that they liked the design. Despite being located in a heritage area, we were able to gain permission to demolish a pretty unremarkable shopfront and build a new three storey mixed use development. With this major hurdle finished, we’re looking forward to beginning working drawings on what should be a fantastic project. I am particularly excited about the three different residential unit types in the project. Each unit is spread out on either two or three floors and has ample deck space, excellent access to northern light, treetop views, open living areas and vaulted ceilings…not bad for an otherwise tight urban infill development.